These are not the faces you would expect to find in an African Children's choir, are they? 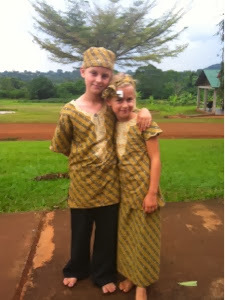 But the children here at Good Shepherd's Fold have welcomed our oldest two children into their choir and are teaching our kids to drum, dance and sing in the Luganda language. This past weekend was a choir camp here at GSF. The kids practiced many songs, played games, and even watched the "Sound of Music." Elijah and Esther really enjoyed the opportunity to better get to know the kids who live here at GSF. One of the girls who grew up here leads the choir along with help from several of the teenagers. They sound really good, and it is fun to watch them dancing. 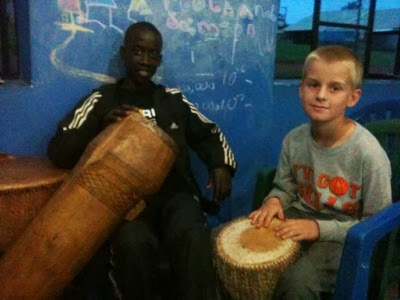 One very kind boy, named Henry, has been helping Elijah learn how to play the drums. Henry has been here at GSF for many years and is a great drummer. It was so nice seeing him take his free times to help Elijah learn the rhythms. Elijah is really catching on. I am very thankful that Elijah and Esther are getting some music instruction and making new friends. This weekend of camp was great!